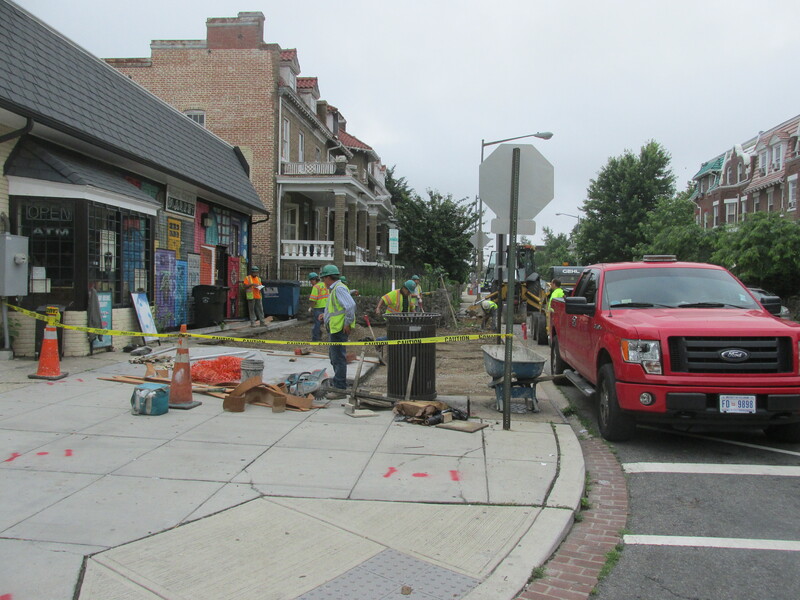 Update on Sidewalk Improvement Progress | Park View, D.C.
Areas scheduled for sidewalk replacements. 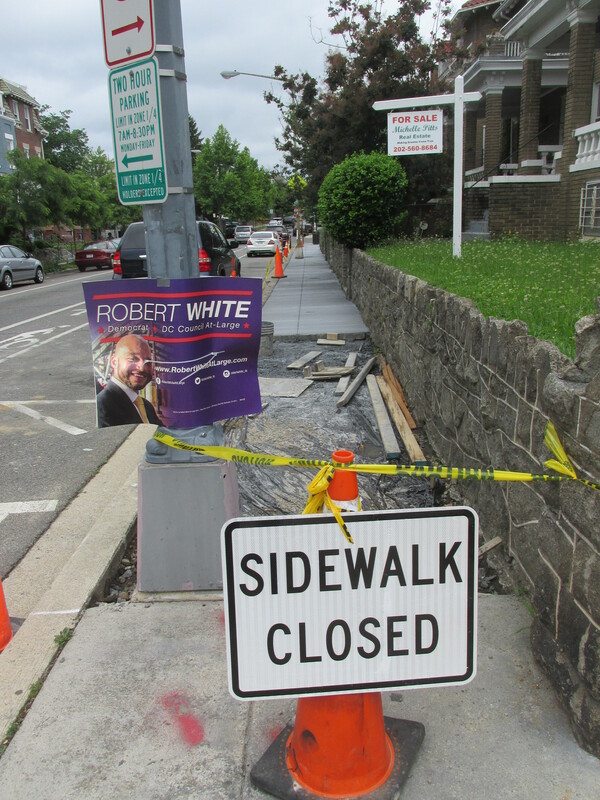 The sidewalk replacement work that I shared in early May is well underway. In walking around the neighborhood this weekend, I noted that the new sidewalks have been replaced on the 600 block of Princeton Place (with the exception of one crosswalk that needs to be redone at the corner of Park Place), the sidewalk on Park Place between Newton and Otis has been replaced, the sidewalk on Warder between Quebec and Rock Creek Church Road is in progress, and work on the sidewalk on the 400 block of Park Road has not yet begun. Below are some photos of the areas recently completed or in progress. 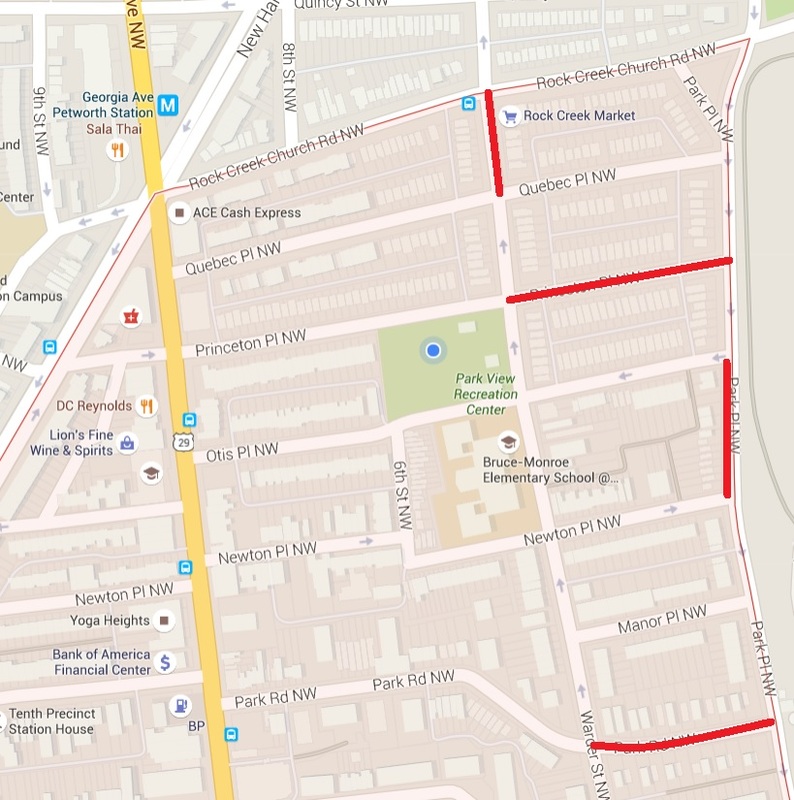 This entry was posted on June 6, 2016 at 7:01 am and is filed under Restoration repair and maintenance, Sidewalk improvements. You can subscribe via RSS 2.0 feed to this post's comments. I’m glad they fixed the sidewalks, but when they finished the one in front of my house (on Park Place), it’s noticeably lower than the old one was. Which means the first step up onto my property is extra big, and I’m afraid it’s dangerous (especially for kids or in bad weather, etc). Same goes for my neighbors’ steps for the most part. I don’t want anyone to get hurt, and I also don’t want to end up being liable if anyone were to get hurt. Do you have any thoughts on this? Chances we could get them to fix it? Or what the liability is? The quality of the sidewalks are awful. The lines aren’t straight, they even don’t appear to be level when you look at the from far away, and they have had to tear up and redo many of them right after they are finished. How can I get them to redo the one in front of my house so we don’t have someone getting hurt falling off our giant step, do you know by chance? Emily, last night I took pictures that I am going to send to Kent. I seriously believe they need to stop this project immediately. Just on the small section of Princeton Place there are cracks in the week old concrete, the expansion joins are popping out, and there are multiple squares without a quarter inch expansion gutter – which means they will crack in hot weather. 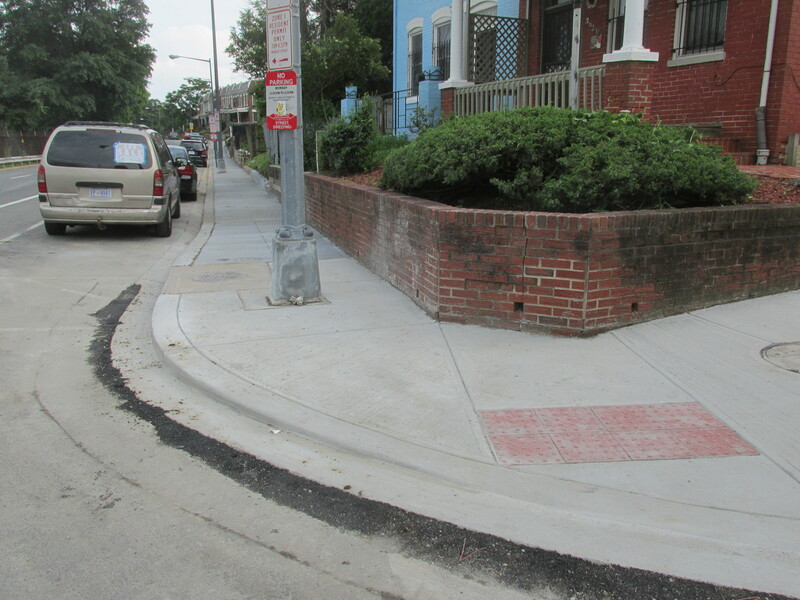 I have no idea who does quality control for DDOT but they are racing through these sidewalks so quickly that they look awful and will not hold up for more than a few months. hope they’re going to install more trash cans on these sidewalks.